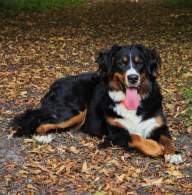 The Bernese Mountain Dog (aka Bernur Sennenhund in Switzerland) is one of several similar looking breeds of Swiss Mountain Dogs. This name translates to "alpine pasture dog" and indeed the breed did originate in the lower Alps region of Bern where these dogs worked as cart pulling and herding dogs on farms. Although they require daily exercise, they are not very high energy dogs so large apartments and indoors of houses will suit this breed just fine. Bernese Mountain Dogs are loyal companions and are not suited for outdoor living because they enjoy being in the presence of the owner and/or family. These dogs do best in cool to very cold weather as you can see by the thick coat and hardy build, so they should not live in warm or hot climates. They should be exercised at night or early morning so warmer temperatures can be avoided. Bernies are not guard dogs and are not aggressive. This breed is easily trained and enjoys being tasked. Unfortunately, there is less genetic diversity in purebred dogs and so due to this limited gene pool these dogs have several common health issues. Arthritis and cancer are serious issues that happen at much higher frequency and much earlier age compared to most other breeds (they are at least twice as susceptible) Owners should be capable and willing to cover these veterinary bills. The Bernese Mountain Dog, a member of the Working group of breeds, has been a multi-purpose farm dog for centuries (though these Swiss mountain breed types have only been popular worldwide since the early 1900s). As large, energetic dogs with thick coats, BMDs are best suited for people living in colder climates who have plenty of indoor (and outdoor) space. Bernese Mountain Dogs are large, heavy, and sturdy dogs with a length more than equal to the height. Member of this breed range from 23-27 inches in height and can weigh up to 120 pounds. This breed has an easily recognizable standard look of thick black and white coat, with notable white chest and rust colored markings. A flat head with triangular shaped ears is also typical. This breed is a natural companion and does not like to spend most of it's time alone. This dog is not only good-natured but also calm, laid-back, tolerant making it very suitable to being around children. Due to it's size there is a risk of accidentally knocking over small children so supervision is imperative if that is a possibility. Although Bernies don't mind pulling children around in wagons, they may not be a willing playmate as they prefer to play with other pets as opposed to people. In other words, they would rather be stretched out on the floor next to you than actively fetching sticks for your kids. Strangers needn't beware this dog because he/she is not a guard dog; they may bark to alert but are otherwise not interested in strangers. 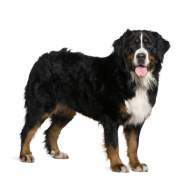 The Bernese Mountain Dog is a high shedding dog all year round. They do not need frequent baths but do need frequent ear and teeth cleaning. Brushing a few times a week is also necessary to keep the coat in good shape. Positive reinforcement training is recommended. This is not a good dog for an owner that has little time. It needs the presence of family or the owner and a daily walk, hike, or at least a large yard. The Bernese Mountain Dog, or technically its' ancestors, made their way to Switzerland over 2,000 years ago along with the invading Romans. 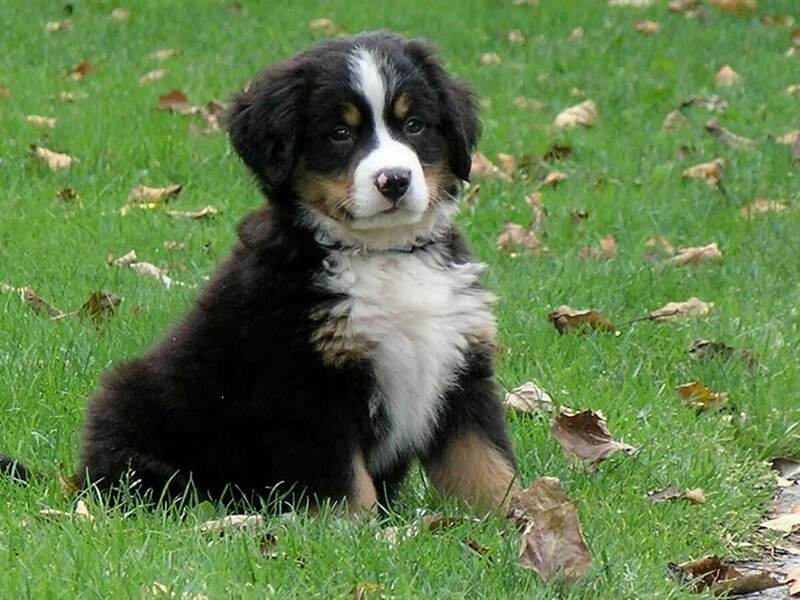 These ancestors that were Mastiff-like were bred with Swiss herding and farm dogs, and even still Bernese Mountain dogs work on and watch over farms herding and pulling carts. A decline of agriculture and subsequent drop in need of cart pulling dogs resulted in very low Bernese Mountain Dog population. Although their arrival was so long ago, these dogs were not bred frequently until 1892 when Albert Heim realized their possibility for extinction. Originally only found in a specific region of the Alps, the finest breed standards are now in the Durrbach area where he began breeding them. The breed made its debut in the United States in 1926 when the dogs were imported by farmers from Kansas and Louisiana. The Bernese Mountain Dog gained AKC recognition 11 years later in 1937 and a 'Bernese Mountain Dog Club of America' was established in 1968. This breed appears only slightly longer than tall with members of the breed standing at 23-27 inches. Bernese Mountain Dogs look sturdy and strong, they are muscular under their long outer coats and thick, wool-like undercoats. Members of the breed have triangle-shaped ears in line with the top of their flat heads. They have fairly long, silky coats that vary between straight and slightly wavy. 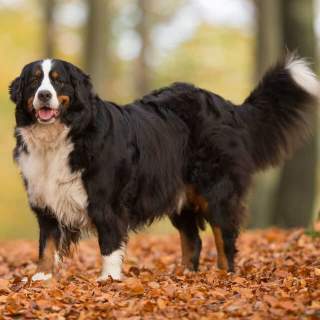 The coat is thick and tail bushy, since the breed originated in the Swiss Alps region, and occurs in some combination of black, white, rust and tan. Markings include rust or tan color in the brow area, around the mouth, and on the lower legs. The chest and around the nose are typically white. 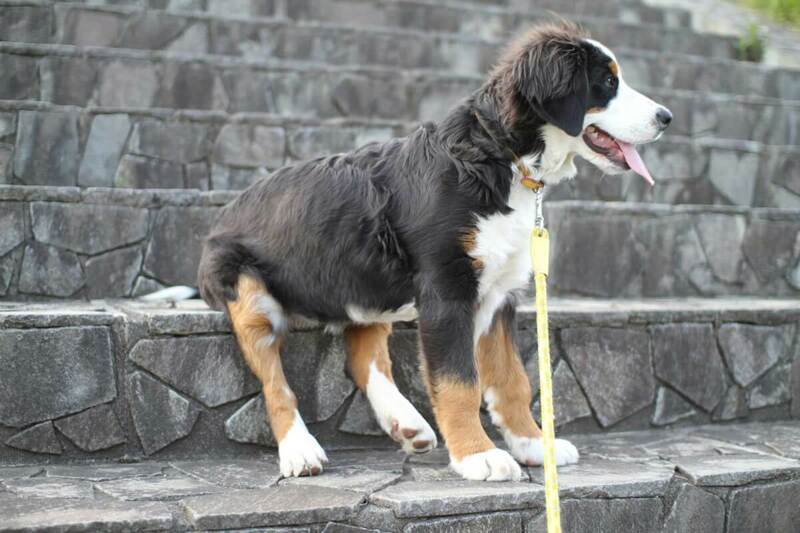 The legs of the Bernese Mountain Dog are long and sturdy. The coloration of this breed is very recognizable. These dogs have coats of white, black, tan and rust in various combinations: black, rust and white; black, tan and white; black and rust; black and white; rust and white. The most standard, common combinations are the black, rust and white and also the black, tan and white. It is standard for this breed to have tan or rust colored markings on the lower legs, around the mouth, and in the brow area. The chest and nose area on the face are also white. 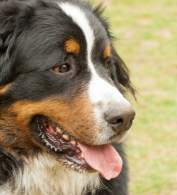 The Bernese Mountain Dog is considered a sturdy dog, large and heavy. The average male Bernese Mountain dog is around 25- 27 inches high and weighs in at 100-120 pounds; similarly the female stands 23-26 inches tall and weighs 70-100 pounds. 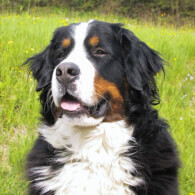 The Bernese is one of many Swiss mountain dog breeds, however, within the specific breed there is little variation among purebred individuals. These dogs are large, big, huge, GIANT--even-- and there will always be a desire for smaller Bernese Mountain Dogs. Some breeders will cross naturally small individuals but sometimes these dogs are runts because they are unhealthy and crossing two unhealthy dogs just creates a litter of puppies that look cuter but may have more health issues. It is much more difficult to find a Miniature Bernese Mountain Dog for sale than a hybrid cross of BMD with another breed (like a Poodle) to create a dog that may have features of the Bernese but a more manageable size. This particular example is called a Bernedoodle and they are quite popular and easy to find. 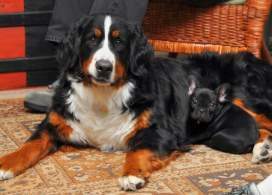 The same idea works for Teacup and Toy Bernese Mountain Dogs, although these are not as in demand. 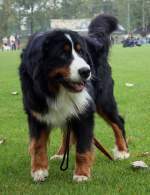 There are usually no purebred short haired Bernese Mountain Dogs. The coat is medium-long and silky and the breed standard discourages cutting. If you see a short coat, it has likely been groomed that way. The best way to describe this breed is a "good-natured", loyal companion. These dogs are somewhat affectionate and will want to be a partner to you but are also independent; it may be better to say they will want to be in your presence. They are not high energy but instead calm and laid-back and are never aggressive, even around strangers. If they are in a playful mood Bernese Mountain Dogs prefer to play alone or with other pets so families looking for a dog for kids to play with may be disappointed. Even though these dogs are now considered companions they are still capable of herding, drafting and droving and therefore suitable for farm life. The consensus on this breed is that they are fairly easy to train because they enjoy being tasked. Positive reinforcement should be utilized during training since Bernies are considered "sensitive". The AKC recommends a socialization course at 4-6 months as well as obedience training shortly after that. These are large dogs so to be at their best with pets, children and strangers they need to be trained. Members of this breed do very well with children as they are gentle, tolerant and are not high energy or aggressive. Due to a natural inclination to enjoy pulling and dragging things (probably originating from the breeds farm dog past), they may enjoy pulling children around in wagons or carts. Do not expect them to be a playmate for children though as they are low energy and prefer to play with other pets as opposed to humans. Very small children should be supervised around Bernese mountain dogs as their sheer size may cause them to knock a child over. They do enjoy to always be in the presence of the family though. As mountain dogs, they are excellent in their herding, guarding, and rescue duties — but is a Bernese Mountain Dog and cats a good mix? This is definitely not a question to be asked after the fact! 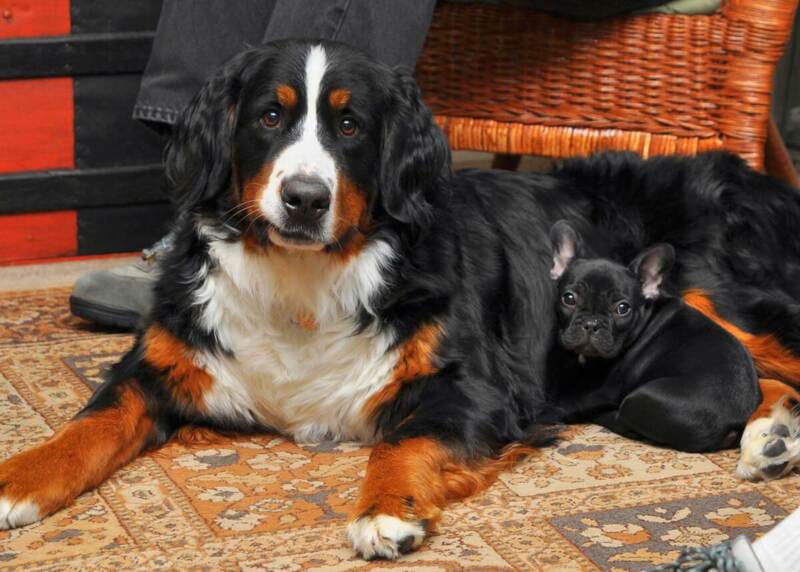 Fortunately, Berners are typically good with cats. If they grow up together, there should be little trouble. If they are introduced later in life, then there will be some work but not nearly as much as with most other breeds. Still, some Bernese Mountain Dogs might have a strong prey drive toward cats as well as rabbits, hamsters and other small furries. Their size might prompt cats to challenge them too, regardless of their growing up as "siblings." This breed is not really considered a guard dog anymore, and although it could be considered a watch dog, now is thought of as primarily a companion dog. They may bark to alert you to a stranger but typically will not protect you. Even if the owner shows approval of the stranger, these dogs will likely stay reserved. Below are pictures of the Bernese Mountain Dog dog breed. This breed doesn't require regular bathing (once every other month is typical) unless they are farm dogs and spend a lot of time in the dirt, but they should be looked over to make sure the skin is in good shape in between bathings. Teeth and ears should be cleaned at least weekly and nails should be trimmed monthly. As this breed is prone to skeletal and joint issues at an early age, it is likely the owner will need to purchase lifting aids and ramps for the house and car. 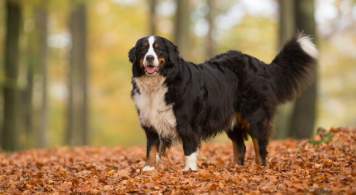 Many other health issues arise in this breed so owners should be ready and willing to pay various veterinary bills in the latter half of the Bernese Mountain Dog's life. The coat should be brushed a few times per week. Members of this breed shed quite a bit all year round so it is necessary for owners to have a vacuum handy. These dogs typically have dew claws removed. Bathing is only necessary once every other month and special attention should be paid to making sure the ears are cleaned. Ear and teeth cleaning should be performed weekly and nails trimmed only monthly. The Bernese Mountain Dog needs a large yard, especially if the owner does not have at least 30 minutes per day to exercise their pet. This breed prefers more exercise and loves to hike. They will let you know if they are not given enough exercise by beginning to whine or chew. Due to this pet's size, if not properly leash trained it may seem like they are pulling you on your walks. These dogs don't mind pulling carts and wagons so small children may also be able to participate in the Bernie's exercise routines. This breed has a very low heat tolerance so in instances of heat should be exercised in the evening. 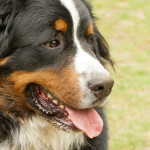 Bernese Mountain Dogs as pets	are not just big dogs. They need things other than food and grooming. When by themselves out in the mountains and other lonely places, they are often occupied by doing their jobs overseeing herds and guarding against predators. In domestic situations, however, they can get separation anxiety. They don't bark much, fortunately. If they do, that is often a major sign of that anxiety. They are not so much friendly as guarded if approached by strangers, and they'll often be aloof to friends of their humans until they are comfortable with those friends. For those who live in a small apartment, owning a Bernese Mountain Dog is not recommended. They are also not comfortable in hot or humid climates. If you must have one of these dogs, you'll want a large house or at least a big, strongly fenced yard. Allergy sufferers beware! The Berner is not hypoallergenic. These dogs shed massively a couple times a year, and they might suddenly start shedding if there is a long hot spell. Otherwise, they'll shed almost constantly and moderately. This is a very fit, sturdy dog that fares very well in cold temperatures but does not have a high tolerance for high temperatures at all. In fact, these dogs should live in cool to very cold areas and in the event of higher temperatures should only be exercised in the early morning or evening. Arthritis and other skeletal and joint problems are much more commonly seen in this breed that most others and come about at an earlier age (starting as early as 4 years). 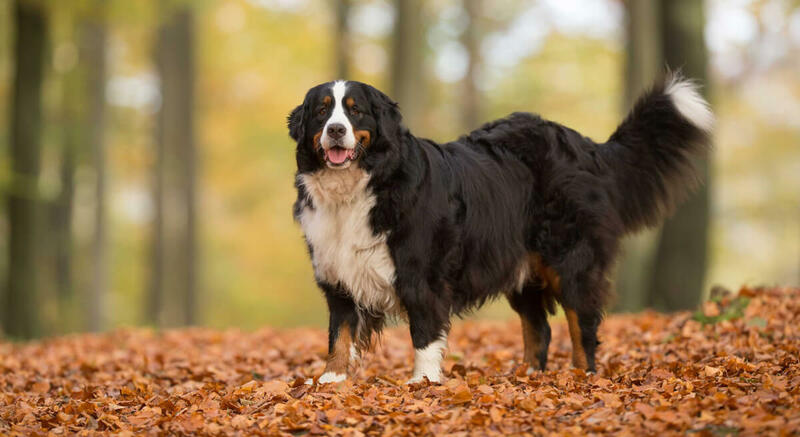 Large dog problems such as hip, knee, elbow and eye issues along with stomach torsion are also typical.Cancer is also a more common disease for this breed than others and studies show that over half of Bernese Mountain dogs die of cancer. Chemotherapy, surgery, and medication for your dog may be available at animal hospitals and university veterinary centers in your area should this misfortune ever befall your companion. 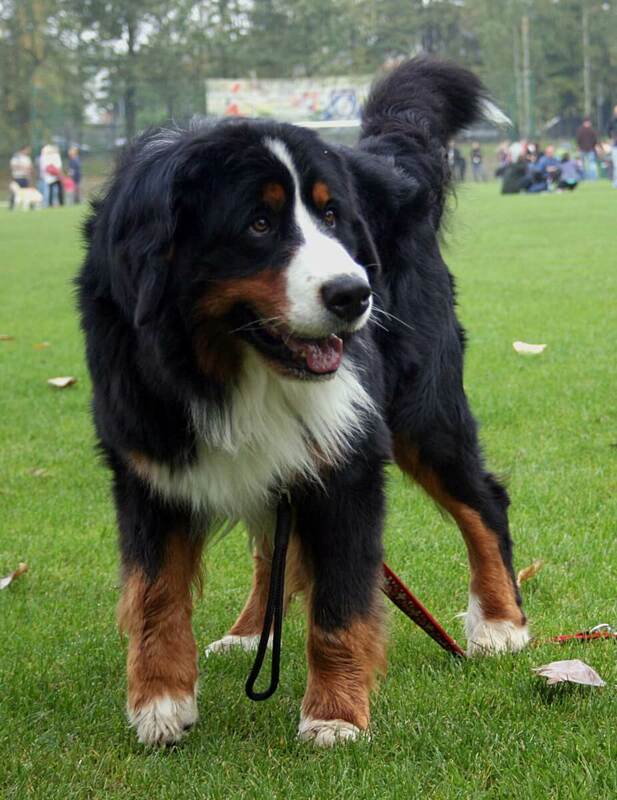 You can expect the Bernese Mountain Dog to live 7-9 years; as expected from many large dog breeds they have a short lifespan and the Bernie is on the lower end of this category. 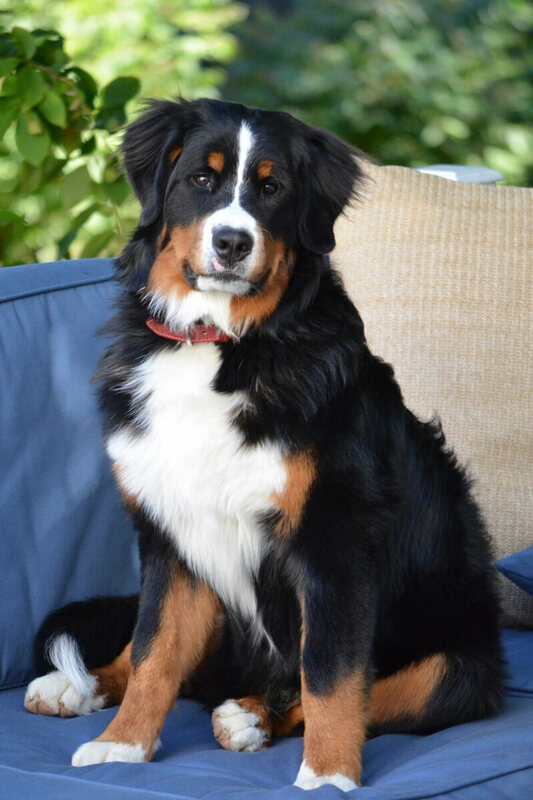 According the the Bernese Mountain Dog Club of America there is a Swiss saying that goes something like this: "three years young dog, three years good dog, three years old dog, everything else is a gift from God."